Summer Snowflake is not easily confused with other wild plants on this web site. A delightful plant to come across, Summer Snowflake seems to hide in clumps in the shade at the back of damp, riverside meadows. It is a tall (to 60 cm), graceful, bulbous perennial which is a native wildflower that is also widely cultivated. Snow-white, bell-shaped flowers (15–20 mm) are borne in umbels of 2–5. These emerge from a spathe, each flower with petals which have a green patch near the tip, and are carried on hollow winged stems. 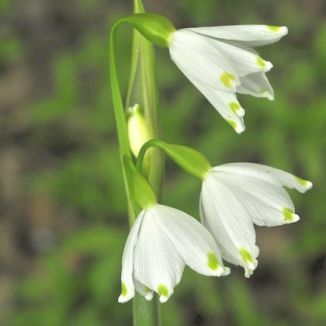 The leaves are bright green, strap-shaped and about the same length as the flowering stems. Flowering in April and May, this is a member of the Liliaceae family. I first recorded this lovely wildflower growing near Inistioge, Co Kilkenny in May 2010, after Jimmy Goodwin, (Coded Web Design - the designer of this website), suggested I might visit that area. I am grateful to him and also to the Vice-County Recorder for Co Kilkenny, Roger Goodwillie, for confirming the identification. 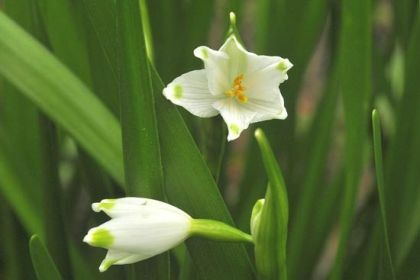 Also known as Loddon Lily, (these plants grew beside the River Loddon in Berkshire), the seeds of this plant are often dispersed by floating down rivers.